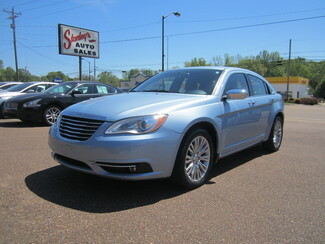 2012 Chrysler 200 Limited! Low miles! Clean Carfax! Comes with leather seats, remote keyless entry, power door locks, power windows, tilt steering wheel and cruise control. Answer calls seamlessly using hands-free Bluetooth enabled technology included on this vehicle. Drivers and Passengers enjoy separate climate controls on this vehicle. Enjoy MP3s with this built-in CD/MP3/stereo system. Bring your iPod and enjoy your own music with a factory installed iPod adapter in this vehicle. No more boring radio stations; you have a variety to choose from with Satellite Radio. You'll have change leftover when filling up this fuel efficient ride. Comes with a remote starter system allowing you to cool down or warm up your car before driving. Enhanced gloss and a sparkling shine truly stand out on this vehicle.